Has ageing wine become irrelevant? How is the maiden vintage Columella 2000 from Eben Sadie faring? Bar a single bottle still remaining in my late dad’s cellar, I’m not sure there’s any left to take a view on. Recently, there have been a number of articles by prominent commentators suggesting that wines are now made for earlier drinking and the discussion about age-worthiness is becoming irrelevant. Various reasons are put forward for this. “Some of this conversation [about diminished ageing potential] is fuelled by climate change, that warmer vintages lead to enhanced ripeness and in turn to readier accessibility, some of it by the assumption of impatience – that the newer generation of wine drinkers is disinclined to defer gratification,” writes local critic Michael Fridjhon in an article entitled “Will today’s vintages stand the test of time?” which appeared on BusinessLIVE.co.za on 13 January. I’m less despondent than either Fridjhon or Walls about the demise of wines made for ageing. Firstly, I think age-worthiness remains a key determinant of wine quality in the minds of wine enthusiasts – whenever casual conversation turns to who is making South Africa’s best wine, maturation potential always comes up as being important. The problem is that while the wines of the 1960s and 1970s are eulogized (bottles of GS ’66 and ’68 opened with monotonous regularity in certain circles), nobody is looking at the wines from the 1990s and 2000s with any critical rigour. Next, the argument is often made that “power and concentration are out; freshness and drinkability are in”, with the former a prerequisite for age-worthiness and the latter a preclusion, but this is a bit of a false dichotomy in my mind. Wines which I have been able to follow from release into brilliant maturity like Kanonkop Paul Sauer 1995 never started out particularly big but rather always had the inherent structure and balance to ensure great drinking over a long period. Of the current state of play, Fridjhon writes “What is certain is that there are precious few current release South African reds that I’d be happy to keep for more than 10 years after the vintage and almost none which would profit from that kind of extended ageing [of 50-odd years].” Again, I think this is unduly pessimistic – whether you are buying wine to take advantage of the emerging secondary market or purely for enjoyment, then there are more than enough options for the astute collector from Kanonkop to yes, Columella with something like Mveme Raats de Compostella in between. What I would suggest, however, is that those producers who aspire to the very top of the quality pyramid hold library stock back and be more inclined to showcase under the right circumstances. I’m not sure how things have changed in Europe, but for the last many decades in South Africa not that much has changed in terms of the fact that most wine is consumed soon after being bought. What needs to be taken into account is that many oblivious oompies used to age their wines in ghastly storage conditions and would proudly present old, oxidated wines with badly leaking corks to adoring guests, all of them too bowled over by the hallowed age of the bottle to taste anything wrong. Or if they do, to mention it. Sure, even though wine is not supposed to be kept in an environment that’s comfortable for humans, most people still like to keep their wines on semi-display (vanity?). But, at the more knowledgeable end of the wine lovers contingent, I know many people with proper (or at least acceptable) storage space for their wines at home. Add maturation facilities like Wine Cellar (Bergkelder being the only major option back in the days) and hugely improved sales of maturation fridges and it seems like the serious wine lovers of the modern age still understand that most top wines deserve time to show their best. As to Columella 2000 – there’s quite a bit around to take a view on, in fact, and it’s still drinking very well (I think Michael Fridjhon is unduly pessimistic about 10 year olds at least). Eben Sadie did 2000-2014 verticals recently in Johannesburg and Cape Town, and also released some of his library stock. I know Singita still has some, as does (I think) Aubergine, for example. And I have a couple too, as I’m sure do some other early admirers of Columella. Hi Tim, Hats off to establishments like Aubergine and Singita for maintaining proper cellars. 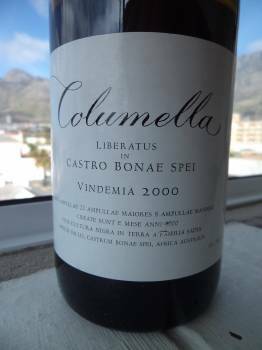 By the way, I gather that what is left of Columella 2000 is changing hands for between R3 500 and R4 000 a bottle. Who says the secondary market for SA wine will never happen? I also share the same view that a wine does not need to be powerful and heavy to stand the test of time but it need the structure instead. This is such an interesting subject. I wax and wane between whether or not the wines of today will age as well as the wines of previous epochs every time I open one that either seems to be fading, or seems to be getting better. Love to see more opinion pieces CE.